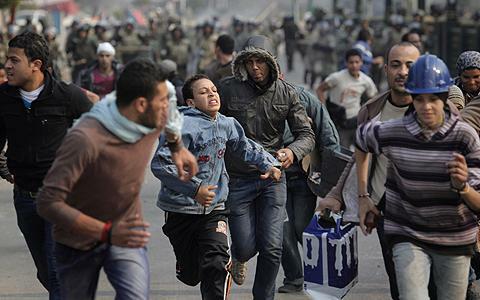 Clashes between security forces and protesters in Cairo raged for a second straight day Saturday. At least eight people were killed and more than 300 wounded. Egyptian soldiers hurled rocks from rooftops to disperse protesters trying to gather near the parliament building in Tahrir Square, and billowing plumes of black smoke from a burning building filled the sky. A VOA reporter saw police using metal clubs against demonstrators trying to assemble to shout their demands for an end to military rule. Protesters erected barricades to protect themselves in some cases. Egyptian Prime Minister Kamal el-Ganzouri said in a television address that security forces are trying to protect government buildings. He confirmed that 18 demonstrators had been treated for bullet wounds, but insisted that security forces carried no weapons. Many Egyptians, like Cairo resident Ehab Abdel Salam, just want the violence to end. "This is a chaotic situation. We can't work any more because of this chaotic situation," he said. "The military should intervene responsibly with the protesters to end this." The violence comes as Egyptians await the official results of this past week's second round of parliamentary elections. Islamist parties appear to be extending their already overwhelming electoral gains. The final results are due to be announced by Sunday. The unrest in Cairo began late Thursday when military police tried to break up a sit-in in front of the Cabinet offices. On Friday, state television aired a statement by the ruling military council denying that troops had tried to disperse the sit-in. The council blamed the violence on protesters who have been camped out in front of the building for three weeks, demanding the ruling military leave power. A senior cleric was among those killed Friday as hundreds of protesters in Cairo hurled rocks and firebombs. Military police responded by firing shots and training water cannon on the demonstrators. It was not clear whether they fired rubber bullets or live ammunition. Members of a civilian advisory panel created by the military this month as a gesture to protesters suspended their work and demanded an immediate end to violence against protesters. The military council has said it will only step down once a president has been elected by the end of June, following a protracted series of phased parliamentary polls.